The Contribution of the Foundation Phase to Physical Literacy. A three year mixed methods study has explored the contribution of the Welsh Foundation Phase to children’s Physical Literacy. The Foundation Phase is a play based curriculum that has an emphasis on the use of the outdoors as an integral part of pupil’s learning. The study looked at many different aspects of the curriculum and its impact. The interpretation and implementation of the Foundation Phase. This phase of the study identified the main aim of the Foundation Phase and its key features as well as outcomes that were assessed in later phases. Motor development of pupils, in particular looking at locomotor and object control skills. Physical Literacy development, focussing on confidence, motivation and physical competence of the pupils and how the playful pedagogy of the Foundation Phase approach contributes to pupils’ holistic well being. The autonomy supportive climate created by the playful pedagogy and its contribution to learning. Fidelity of implementation of the Foundation Phase curriculum. Publications and conference presentations for this research. High Intensity Training and the Older Population. This research examined the effects of a 6 week High Intensity Interval training programme in aging men (+60). This world leading study has had over 26 peer reviewed publications and presentations on aspects of muscle power, recovery, quality of life and motivation to exercise, peak power, body composition and testosterone levels. For a full list of the publications follow the link here. Evaluation of Pilot Outdoor Education Residential Experience for the School of Education, University of Strathclyde, Scotland. In January 2015 the Wales Institute for Physical Literacy was invited to evaluate the impact of a pilot residential programme of outdoor education for year 1 students studying Education at the University of Strathclyde in Scotland. Key findings of the study suggest students felt the outdoor residential programme was very successful in meeting a range of different student concerns and aspirations. In particular it met the students’ requirements to: gain additional professional experience that would differentiate them to future employers; address feelings of disconnection from their course and university; develop new friendship groups and improve student-tutor relationships; and learn more about outdoor pedagogy in the Scottish Curriculum for Excellence. This research is aimed at injury reduction initially with a focus on Rugby Union. Kate has a special interest in concussion, lumbar and pelvic hip injuries. The research study involves working with professional rugby players to put in place injury prevention strategies in order to maximise squad availability and team success. A phenomenological perspective on motivation and determinants of physical activity and health around Mass Participation Sport Events in Pembrokeshire. Over the last ten years there has been unprecedented growth and participation in a range of new and exciting activities such as triathlon, open water swimming and parkrun. Collectively these activities are known as Mass Participation Sports Events (MPSE). Focused in Pembrokeshire where Ironman Wales is located Kate’s study is a 3 year, scholarship funded, PhD that aims to better understand the upsurge in interest in these events by providing a phenomenological perspective of motivations and determinants of physical activity and health experienced by MPSE participants. The study draws together Physical Literacy across its outdoor, recreational, motivational and regional dimensions. The impact of a programme of professional development for early childhood teachers and practitioners in Successful Kinaesthetic Instruction for Pre-schoolers (SKIP Cymru) on pupils’ physical development and physical activity behaviours. At a time of unprecedented concern around the inactivity of young children and the rise in sedentary behaviours this study will assess the effectiveness of SKIP Cymru in the Foundation Phase in Wales. It will examine how changes in teachers’ pedagogical content knowledge impact on pupils’ physical development and physical activity behaviours. Through widespread access to schools in Pembrokeshire Amanda’s study is a 3 year, scholarship funded, PhD that develops from the work of Dr Nalda Wainwright to explore Physical Literacy through the relationship between physical competence and physical activity levels of pupils’ in the Foundation Phase in Wales. How can a pedagogical model for adventurous activities be implemented within the physical education curriculum? Adventurous activities are a statutory aspect of physical education provision in Wales yet pupils’ experience of AA is often limited to unchallenging orienteering lessons or a one-off visit to an outdoor centre. Graham’s study explores the implementation and impact of a new approach to outdoor and adventurous activities for pupils in Wales that seeks to increase the opportunities for school-based, teacher-initiated and pupil-foused AA. Drawing upon the work of Dr Andy Williams and Dr Nalda Wainwright this study examines Physical Literacy links between adventurous activities and school-based physical education. What contribution does Welsh medium outdoor education at Glan-Llyn OE centre make to the cultural development of young people in Wales? Wales is a bilingual country historically, socially and culturally and Canolfan Addysg Awyr Agored Glan-Llyn / Glan Llyn Outdoor Education Centre is a key location for the delivery of outdoor education in a welsh language context for young people in Wales. Arwel’s research examines the impact of Glan Llyn upon young people’s cultural development and takes an innovative ethnographic approach to investigate the cultural messages that are promoted and received during a residential visit to the centre. The study explores Physical Literacy links across outdoor activities, language and culture. Does one high intensity training session per week provide late middle aged women with the equivalent physical and functional adaptations to those achieved by the following the current American College of Sports Medicine (ACSM) internationally recognised guidelines for exercise. Current epidemiological evidence indicates that late middle aged women (45-65 years) who are inactive are likely to have lower physiological and physical capacities than those who train on a regular basis. This ultimately leads to greater incidence of illness and disability as they get older reducing their quality of life and places a preventable burden on the health care systems. Dave’s research aims to determine whether one high intensity training session per week will provide the same physical and functional adaptations as suggested by ACSM. 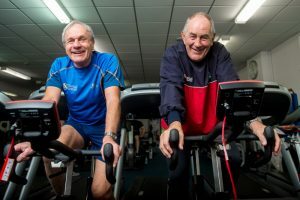 Dave’s study develops the work of Dr Peter Herbert and extends our understanding of Physical Literacy by focusing on physical activity, older people and strength training. Andy and Nalda’s current research investigates higher education students’ responses to a module of learning structured around a new pedagogical model for Adventurous Activities. Developing from their work in 2016 that identified 4 key features or ‘non-negotiables’ (mainly outdoors, experiential learning, challenge-by-choice and managed risk) that need to be present for adventurous activity learning to take place. This current research evaluates the student’s experiences of this new model for adventurous activities learning. Hayes L, Sculthorpe N, Herbert P, Baker J, Hullin D, Kilduff L & Grace FM. (2015). Resting steroid hormone concentrations in lifetime exercisers and lifetime sedentary males. The Aging Male, 18(1): 22-26. Hayes LD, Sculthorpe N, Herbert P, Baker JS, Spagna R, Grace FM (2015). Six weeks of conditioning exercise increases total, but not free testosterone in lifelong sedentary aging men. Aging Male, Jun 1:1-6. [Epub ahead of print]. Herbert P, Grace FM & Sculthorpe N (2015). Exercising caution: prolonged recovery to a single session of high-intensity interval training in older men. Journal of the American Gerontology Society 63(4): 817-818. Grace FM, Herbert P, Ratcliffe J, New K, Baker J & Sculthorpe N (2015). Age related vascular endothelial function following lifelong sedentariness: positive impact of cardiovascular conditioning without further improvement following low frequency high intensity interval training. Physiological Reports 3, e12234. Knowles A, Herbert P, Sculthorpe N, Easton C & Grace F (2015). Impact of low volume, high intensity interval training on maximal aerobic capacity, health-related quality of life and motivation to exercise in ageing men. AGE 37(2): 1-12. Sculthorpe N, Herbert P, Grace FM (2015). Low Frequency High intensity interval training (HIIT) is an effective method to improve muscle power in lifelong sedentary ageing men: a randomized controlled trial (RCT). Journal of American Gerontology Society [In Press]. Hayes L, Sculthorpe N, Herbert P, Baker J, Hullin D, Kilduff L, Reed D, Spagna R & Grace FM. (2014). Salivary testosterone measurement does not identify biochemical hypogonadism in aging men: a ROC analysis. Endocrine, 1-4. Hayes L, Grace F, Sculthorpe N, Herbert P, Kilduff L & Baker J. (2013). Does chronic exercise attenuate age-related physiological decline in males? Research in Sports Medicine 21, 343-354. Hayes L, Grace FM, Sculthorpe N, Herbert P, Ratcliffe J, Kilduff L & Baker J. (2013). The effects of a formal exercise training programme on salivary hormone concentrations and body composition in previously sedentary aging men. Springerplus 2, 1-5. Rethinking Adventurous Activities in Physical Education: Models-Based Approaches. Submitted to Journal of Adventure Education and Outdoor Learning in November 2018. Under review. Dudley, D., Cairney, J., Wainwright, N., Kriellaars, D. and Mitchell, D. (2017) Critical Considerations for Physical Literacy Policy in Public Health, Recreation, Sport and Education Agencies. Quest 69(4)pp 463-452. Williams, A. and Wainwright, N. (2016) A new pedagogical model for adventure in the curriculum: Part 1 – advocating for the model. Journal of Physical Education and Sport Pedagogy. DOI:10.1080/17408989.2015.104821. Williams, A. and Wainwright, N. (2016) A new pedagogical model for adventure in the curriculum: Part 2 – outlining the model. Journal of Physical Education and Sport Pedagogy . DOI:10.1080/17408989.2015.104822. Evaluation of pilot outdoor education residential experience for the School of Education, University of Strathclyde. Williams, A. and Wainwright, N. (2015) Wales Institute for Physical Literacy. Wainwright, N. (2013) Physical Literacy in the Foundation Phase in Wales. Journal of Sport Science and Physical Education, ICSSPE Bulletin 65 Special Feature Physical Literacy. Wainwright, N. and Williams, A. (2012) “Miss that’s the best PE lesson we’ve ever had and we couldn’t see for most of it.” Adventurous Activities and Physical Education in Wales. Physical Education Matters, summer, Vol 7 (2), 51 – 54, 2012. Wainwright, N. (2006) ‘Accessing Learning through Effective Physical Education’ In Primary Physical Education Matters vol. 1 no. 3. Edwards L et al. Results from Wales’ 2018 Report Card on Physical Activity for Children and Youth. https://journals.humankinetics.com/doi/full/10.1123/jpah.2018-0544. Stratton G, Edwards L, Tyler R, Blain D, Bryant A, et al.(2018). Active Healthy Kids Wales 2018 Report Card http://www.activehealthykidswales.com/media/reports/AHK-Wales_Report_Card_2018.pdf. Stratton G, Cox R, Mannello M, Mattingley R, Robert C, Sage R, Taylor S, Williams S, Tyler R. (2016). Active Healthy Kids Wales 2016 Report Card. Simpson, S., Williams, S. et alA feasibility randomised controlled trial of a motivational interviewing intervention for weight loss maintenance in adults.NIHR Journals Library, Health Technology Assessment, Volume 19, Issue 50, July 2015. Stratton, G., Williams, S. et al. Healthy Active Kids Report Card (Wales). September 2014.http://www.swansea.ac.uk/activehealthykidswales/. Sabin M, De Hora M, Holly J, Hunt L, Ford A, Williams S, Baker J, Retallick C, Crowne E and Shield J. Fasting non-esterified fatty acid profiles in childhood and their relationship with adiposity, insulin sensitivity and lipids. Pediatrics (2007)120:6; 1426-1433. Taylor J, Williams S, Rhys R, James P, Frenneaux M. Conjugated Linoleic Acid Impairs Endothelial Function. Arteriosclerosis, Thrombosis and Vascular Biology26: 1-6; 2006. Simon Williams. Active Lives: Physical Activity in Disadvantaged Communities. Full Report. Bevan Foundation Policy Paper no. 9. ISBN 1-094767-18-4. The Bevan Foundation, Tredegar, July 2006. Simon Williams and Rhys Williams. Obesity, type 2 diabetes mellitus and the metabolic syndrome: What are the choices for prevention in the twenty-first century? In, McNammee, M (Ed). Philosophy and the Sciences of Exercise, Health and Sport. Essays for Critical Research. Routledge, Novmber 2004. Bourne, M, Williams, M,Jackson, J, Williams, K.L, Timmins, R, Pizzari, T. (2018) Stronger hip abductors in the dominant (kicking) leg of elite soccer players reduces the chance of hip and groin injury: a prospective cohort study. Under Review. Evans, K. (2016). Preventing Hip and Groin Injuries in Professional Rugby Union. Pain to Performance International Sports Medicine Conference, London. Evans, K.L., Hughes, J., & Williams, W.D. (2016). Preventing Lumbo-Pelvic-Hip injuries in professional rugby: an example of the sequence of prevention through to completion. UKSCA Annual Conference, Leicester, UK. Ohlwein, M., Evans, K.L., Sieniawski, J., Shield, A.J., Opar, D., & Williams, M.D. (2016). Eccentric knee flexor strength of International youth field hockey players. UKSCA Annual Conference, Leicester, UK. Ward, K., Grice, M., Di Leva, R., Evans, K. and Baker, J., (2015). Clinical Assessment in Sports Therapy. In Ward, K., and Di Leva, R. (Eds). Routledge Handbook of Sports Therapy, Injury Assessment and Rehabilitation. Routledge. Evans, K., Hughes, J.,Mathews, T., & Williams, M. (2015). Changes in adductor, abductor and hip extension strength following an intermittent running test in professional rugby union players. British Association of Sport and Exercise Sciences (BASES) Annual Conference. St George’s Park, UK. Sieniawski, J., Evans, K., Shield, A., Opar, D., Hughes, J., & Williams, M. (2015). The effect of previous hamstring injury on eccentric knee-flexor strength in professional rugby union. BASES Annual Conference. St George’s Park, UK. Evans, K., & Cady, K. (2010). A Review of Medical Provision in English Ice Hockey. International Sport Science and Sports Medicine (ISSSM) Annual Conference, Newcastle. Evans, K., & Cady, K. (2010). Results of a Musculoskeletal Pre-Participation Screening (MPPS) programme in BUCS Super 8 Rugby League Players. ISSSM Annual Conference, Newcastle. Dobson, A., Evans, K., & Dowdell, S. (2009). The effect of ribose supplementation on repeated maximal cycle ergometry in male collegiate soccer players. BASES Annual Conference. Leeds Metropolitan University. Dobson, A., Evans, K., & Williamson, M. (2009). The effects of single vs. multiple set resistance exercise on maximal muscular strength in untrained men. BASES Annual Conference. Leeds Metropolitan University. Evans, K. L., Smith, D., Dobson, A., & Towers, P. (2008). A comparison of work rate match profiles of a competitive football league match versus a friendly football match. European College of Sport Sciences Conference (ECSS), Estoril, Portugal. Blain, D. & Bellamy, M. (2018). School Gym and physical activity. In Draper, N. & Stratton, G. (Eds.). Physical Activity: A multidisciplinary approach. Abingdon, Oxon: Routeledge. Goodyear, V.A., Blain, D., Quarmby, T. & Wainwright, N. (2016). Dylan: the use of ‘mobile’ ‘apps’ within a tactical inquiry approach. In Casey, A., Goodyear, V. A. & Armour, K. M. Digital Technologies and Learning in Physical Education: Pedagogical Cases. Abingdon, Oxon: Routeledge. Blain, D. (2012). Team of the year 2011. Physical Education Matters, 7(2), pp 62-64. Sculthorpe N, Herbert P & Grace FM. (2015). Low frequency HIIT improves peak power and body composition in sedentary healthy older men. American College of Sports Medicine (ACSM) annual conference, San Diego, CA, 26th-30th May 2015. Herbert P, Sculthorpe N, Baker JS & Grace FM. (2015). Validation of a 6 second cycle test for the determination of Peak Power Output (PPO) using the Wattbike cycle ergometer. American College of Sports Medicine (ACSM) annual conference, San Diego, CA, 26th-30th May 2015. Hayes LD, Sculthorpe N, Herbert P & Grace FM. (2015). Resting steroid hormone concentrations in lifetime exercisers and lifetime sedentary males. American College of Sports Medicine (ACSM) annual conference, San Diego, CA, 26th-30th May 2015. Grace FM, Herbert P & Sculthorpe N. (2015). Prolonged recovery to a single bout of high intensity exercise in ageing men. American College of Sports Medicine (ACSM) annual conference, San Diego, CA, 26th-30th May 2015. Grace FM, Herbert P, Ratcliffe JWT, Kilduff L, Hullin D, Hayes L Baker JS & Sculthorpe N. (2014). Effects of Subsequent High Intensity Interval Training (HIIT) on Resting Testosterone and IGF-1 in Ageing Males. American College of Sports Medicine (ACSM) annual conference, Orlando FL May 27th -31st. Herbert P, Sculthorpe N, Ratcliffe JWT, Baker JS & Grace FM. (2014). Effects of Subsequent High Intensity Interval Training (HIIT) on Balance, Flexibility and Power in Ageing Males. American College of Sports Medicine (ACSM) annual conference, Orlando FL May 27th -31st. Ratcliffe JWT, Sculthorpe N, Herbert P, Kilduff L, Hullin D, Hayes L Baker JS New K & Grace FM. (2014). Effects of Subsequent High Intensity Interval Training (HIIT) on Vascular Function and CV Risk in Aged Males. American College of Sports Medicine (ACSM) annual conference, Orlando FL May 27th -31st. Sculthorpe N, Ratcliffe JWT, Herbert P, Kilduff L, Hullin D, Hayes L Baker JS New K & Grace FM. (2014). Effects Of Subsequent High Intensity Interval Training (HIIT) On L-arginine, Dimethyarginines (ADMA;SDMA) And Their Ratios In Ageing Males. American College of Sports Medicine (ACSM) annual conference, Orlando FL May 27th -31st. Dugdale HF, Raal-Nunes M, Herbert P, Sculthorpe N, Grace FM, Brown WM. Facial symmetry predicts physical fitness in older men: The role of DNA methylation in the paired box 3 (PAX3) gene. BASES student conference, Cardiff Metropolitan University 26-28th March 2013. Herbert P, Ratcliffe J, Sculthorpe N, Baker, J, Richards, J and Grace FM. The effects of a 6 week ACSM intervention on aerobic fitness in sedentary older men. European College of Sport Science annual conference, Barcelona 26-29th June 2013. Ratcliffe J, Sculthorpe N, Herbert P, Baker J, Richards J, New K and Grace FM. The effects of 6 week ACSM intervention on standard cardiovascular measurements in sedentary older men. European College of Sport Science annual conference, Barcelona 26-29th June 2013. Hayes L, Grace FM, Sculthorpe N, Herbert P, Ratcliffe J, Kilduff L and Baker JS. The Effects of a Formal Exercise Training Programme on Hormone Concentrations and Body Composition in Previously Sedentary Aging Men. European College of Sport Science annual conference, Barcelona 26-29th June 2013. Herbert P, Grace FM, Ratcliffe J, Baker J, Richards J and Sculthorpe N. The effects of a 6 week ACSM intervention on measures of power output in sedentary older men. European College of Sport Science annual conference, Barcelona 26-29th June 2013. Herbert P, Sculthorpe N, Ratcliffe J, Baker J, Richards, J and Grace FM. (2013). The effects of a 6 week ACSM exercise intervention on body composition in sedentary older men. European College of Sport Science annual conference, Barcelona 26-29th June. Hayes L, Grace FM, Sculthorpe N, Herbert P, Ratcliffe J, Kilduff L, & Baker J. (2013). The Effects of a Formal Exercise Training Programme on Hormone Concentrations and Body Composition in Previously Sedentary Aging Men. European College of Sport Science annual conference, Barcelona 26-29th June. Brown WM, Raal-Nunes M, Dugdale HF, Ross A, Sully T, Herbert P, Sculthorpe N and Grace FM. (2013) Symmetry predicts physical fitness in older men: The role of DNA methylation in the paired box 3 (PAX3) gene. International Ethological Conference (IEC), Association for the Study of Animal Behaviour, Newcastle, UK, 4-8th August. Goodway, J., Famelia, R., Tsuda, E., Wainwright, N., and John, A. (2017) Summer Success: A pilot program to promote school readiness in Preschoolers from and urban disadvantaged environment. 3rd International Consortium of Motor Development, Nov 9-11, Melagaco, Portugal. Wainwright, N., Goodway, J. Whitehead, M., Williams, A., Kirk, D. (2014) A Study of the interpretation and implementation of the Foundation Phase in Wales and its contribution to physical literacy. International Physical Literacy conference Vancouver June 2015. Wainwright, N. Goodway, J. Whitehead, M. Williams, A. Kirk, D. (2014) Examining the impact of the Foundation Phase on children’s motor development and physical activity. British Educational Research Association Annual Conference, September 23rd 2014. Evans, K., Hughes, J., Mathews, T., & Williams, M. (2015). Changes in adductor, abductor and hip extension strength following an intermittent running test in professional rugby union players. British Association of Sport and Exercise Sciences (BASES) Annual Conference. St George’s Park, UK. How Much Exercise for Weight Loss Maintenance. Invited Lecture at the National Obesity Forum (Wales) Annual Meeting, University Hospital of Wales, Cardiff, May 2012. Fighting Obesity. Inivited Lecture at Prescribing Greenspace, GreenSpace Annual Conference, Mayfair Conference Centre, London, November 2011. Association of alanine aminotransferase with aerobic fitness in healthy children and adolescents in Wales, UK. 3rdWorld Congress on Prediabetes and the Metabolic Syndrome, Nice, France, April 2009 and Journal of Diabetes, Volume 1 Supplement 1, page A179. The effects of aerobic exercise training on visceral adipose tissue, liver fat and glucose tolerance in previously sedentary, overweight and obese non-diabetic men.2nd World Congress on Prediabetes and the Metabolic Syndrome, Barcelona, April 2007 and Diabetes & Vascular Disease Research (2007) 4: S172, 2007 . Association between Aerobic Fitness and Prevalence of Metabolic Syndrome in Children and Adolescents in Wales, UK. 2nd World Congress on Prediabetes and the Metabolic Syndrome, Barcelona, April 2007 and Diabetes and Vascular Disease Research (2007) 4. Prevalence Estimates of the Metabolic Syndrome in Children and Adolescents in Wales, UK. IASO International Congress on Obesity, Sydney, Australia, September 2006 and Obesity Reviews (2006) 7: S2; 234. Obesity prevalence estimates in children and adolescents in Wales, UK: A comparison of standards based on BMI and waist girth. IASO International Congress on Obesity, Sydney, Australia, September 2006 and Obesity Reviews (2006) 7: S2; 234. The prevalence of hypertriglyceridaemia and low HDL-cholesterol in children and adolescents in Wales, UK: Preliminary observations and comparison of paediatric and adult cut-off points. 1stInternational Congress on Prediabetes and the Metabolic Syndrome. Berlin, Germany, April 13th-16th2005. Overweight and obese 12 and 13-year old children show features of the metabolic syndrome and increased fibrinogen but not hyperhomocysteineaemia.13th European Congress on Obesity, Prague, Czech Republic, 26th-29th International Journal of Obesity 28 S1, 2004.